With over 460 million internet users, India is the second largest online market, ranked only behind China. By 2021, there will be about 635.8 million internet users in India. Despite the large base of internet users in India, only 26 percent of the Indian population accessed the internet in 2015. 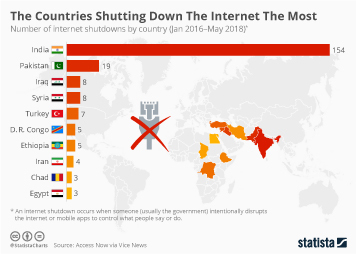 This is a significant increase in comparison to the previous years, considering the internet penetration rate in India stood at about 10 percent in 2011. Furthermore, men dominated internet usage in India with 71 percent to women’s 29 percent. Indians often turn to mobile internet, as the large majority of the digital population in India were mobile internet users in 2016. About 323 million people in India accessed the internet through their mobile phones in 2016, which corresponds to about 24.3 percent of the country’s population. Both figures are forecast to increase in the coming years, with projections to amount to 524.5 million and around 37.4 percent respectively in 2021. Mobile internet usage in India varies according to people's living areas. As of 2016, India had an estimate of 262 million mobile internet users living in urban communities, and 109 million living in rural areas. One aspect whereby India shares the characteristics of other global internet users is its passion for social media. In 2021, it is estimated that there will be around 358.2 million social network users in India, a significant increase from 2016, when this figure stood at about 216.5 million. This means that the share of the Indian population that access social networks is expected to jump from around 16.3 percent in 2016 to just over 25 percent. Facebook is the most popular social networking site in the country. There were about 195 million Facebook users in India as 2016, placing India as the country with the largest Facebook user base in the world. Other popular networks include WhatsApp, Google+, and Skype. With an estimate of 43.8 percent digital buyer penetration in 2016, online shopping is also a popular online activity of Indian internet users. Retail e-commerce sales in India amounted to about 16 billion U.S. dollars that year and are projected to surpass 45 billion U.S. dollars in 2021. Mobile shopping has gained space in the country as well. About 49 percent of Indian consumers stated using their mobiles for purchasing goods or services. This share is above global average – which stood at 38 percent as of 2016 – and the second highest figure in the world, only behind China.